Introducing the deluxe version of the Timber Heaters. What’s the Difference? More fire, more heat! 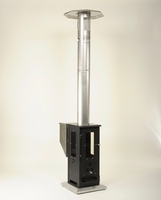 This commercial sized wood pellet patio heater has an incredible 80k BTU output, that will surely keep you and your guests toasty warm.The Big Timber flame is showcased by three 12 inch high temp glass panes. A newly developed firepot allows the big timber to be applied commercially with easy maintenance. The pellets burn efficiently through two main combustion areas and ash build up is easily swiped away with a pull on the firepot rod. The deluxe hopper holds 30 lbs of pellets and burns for approximately four hours. Stop or start your Timber heater easily with the new shutoff key. A stainless steel top reflector, stove pipe, 304 2B Base, American made spring handles, and stainless hardware create a clean look, perfect for any setting. Using Wood pellets as a low carbon alternative fuel just makes sense when compared to the price and efficiency of propane. Pellets run at a quarter of the operating cost, while producing twice the amount of BTUs. The roaring fire is powered only by gravity and the venturi created from the stove pipe. The Big Patio Heater boasts a heating radius of 12 feet, covering almost 600 square feet outdoors! Just look at it this way, the big timber is a controlled bon fire. Deluxe Firepot – The downward flow of pellets is crucial to the ash content elimination and the continual dropping of new fuel. Two combustion areas create a highly efficient burn. A pull out rod allows for easy ash clean up. 3 Sided Fire Viewing – These extra large high temp glass panes provide a mesmerizing view of man’s greatest discovery. Stainless Top Reflector and Spark Arrestor – Stops any sparks from leaving the stove pipe and reflects heat back down. Stainless Base – Ensures a sturdy heater wherever you go. Damper Dial – Controls the temperature of the heater by adjusting the amount airflow. Reach the highest temperatures with the damper dial fully closed. -Dimensions 11W, 20D, and 84 inches T. Weight – 70 lbs. 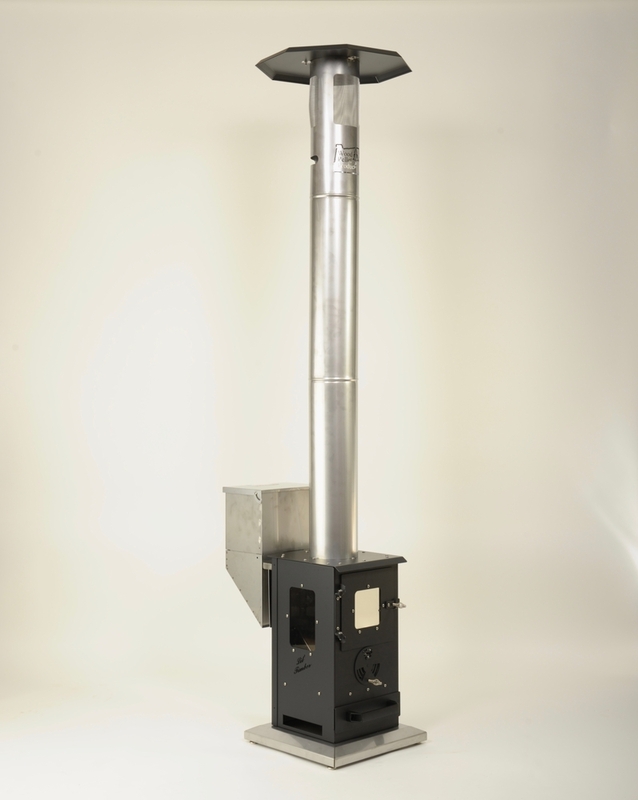 Small patio heater below with optional pellet hopper extension (adds 2 -3 hours burn time to both small and large patio heaters, additional $45). -$45 hopper extensions accessory for an additional 3 hours per extension. -Easy temperature control by dial damper at front of stove. Open lets more air through the unit cooling it down to about 600 degrees F and closing it reduces air flow thus increasing the temperature about 900 degrees max temp. -Shut off time:5 minutes to burn out remaining fuel once shutoff key is inserted. Additional 20 Minutes cool down after fire burns out. -Heat Distance: Heat Radius is 12′ from stove. 450 Sq Ft OUTDOORS! -The Big Timbers combustion efficiency is unparalleled as it actually produces no visible smoke while in use making it an extremely efficient and clean burning device. If you are burning cheap fuel or dirty burning fuel Simply open damper to increase oxygen supply which will clean up the smoke. -Distance to Combustibles: 36” all directions including above unit. -One bag of heating stove pellets will last 8 hours of operation (that’s an average of five dollars a day compared to most propane heaters that consume one five gallon tank costing an average of 20 dollars).